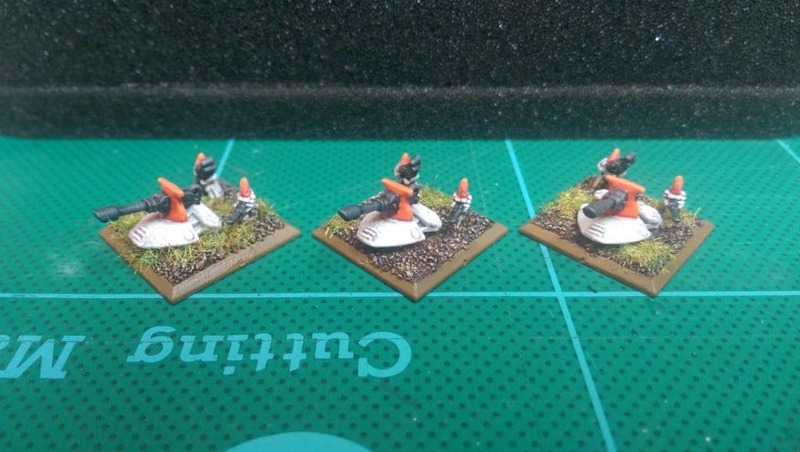 Photos of the first batch of units I’m painting for my new Epic Eldar army. Back in the mists of time (the late 1980s and early 1990s), I played more 2nd edition Epic than any other game. At that time, I built and painted a fair amount of Eldar models to form my main army and I really enjoyed the games I played with them. I’ve long since parted with those models, but I still had a soft spot for Epic Eldar — and the models only got better with releases during the 3rd and 4th editions of Epic. 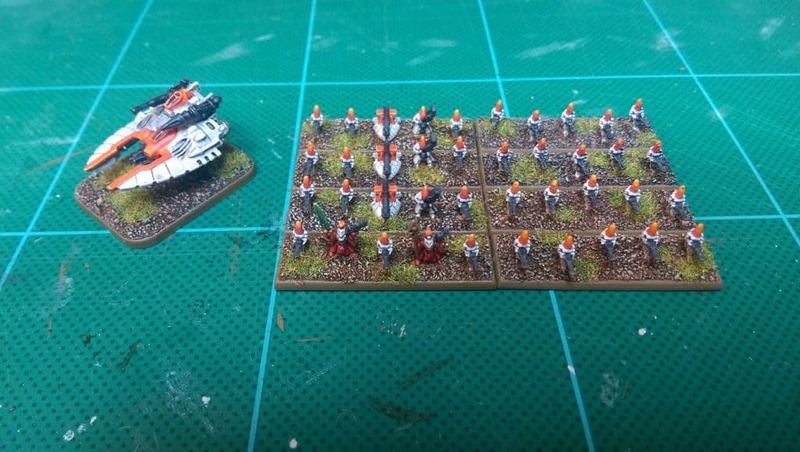 So that my friends and I could get straight into some games without a sea of bare plastic and metal miniatures, I first bought the cores of two ready-painted armies that happened to be on eBay at the time (Space Marines and Imperial Guard). 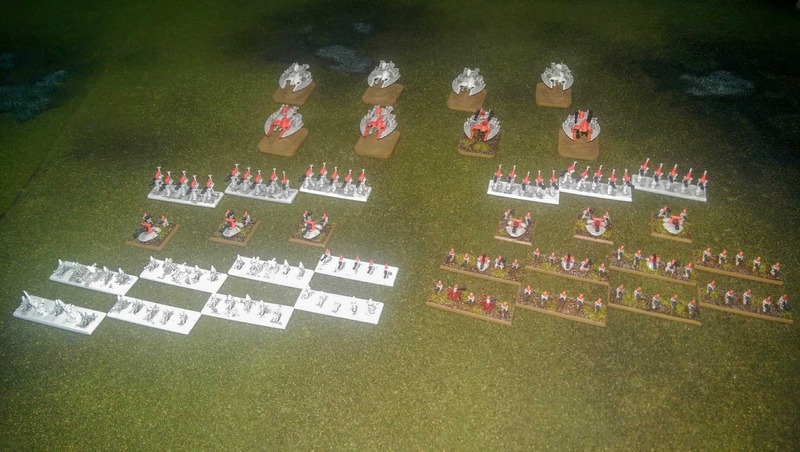 Then, as I had a head-start with these armies, it seemed sensible to expand them as a priority — a short-cut to two sizeable painted armies, each with a good range of formations to choose from to keep games interesting. It took me a while (and a fair amount of cash) to track down the Eldar models that I wanted. Original Games Workshop Eldar models are rarer than models for some of the other factions, especially if you want the later designs. Plus the Eldar have a unique aesthetic that is hard to ‘proxy’ with models from other manufacturers. I’ve made some good progress on the above, so I thought it was about time I made a start on the Eldar. It took me a while to decide on a colour scheme — I wanted something original and striking, yet also quite quick to paint to a respectable ‘table-top standard’. Here’s what I came up with. I’ve got a lot of other things to do, so it’ll be some time before I have a large army of (painted) Eldar. But I’m pleased with how they look so far. Copyright © 2018–2019, Eric Weston and The Hobby Zone. All rights reserved.